In 1868 prehistoric skeletons were discovered in the Vézère valley, and the area was found to be one of the richest in the world in terms of ancient sites and deposits. The small market town of Les Eyzies suddenly became the base for exploring this treasure-trove of antiquities, including the many prehistoric painted caves. The most famous and beautiful of these sites is at Lascaux, discovered by accident in 1940 by boys looking for their dog. 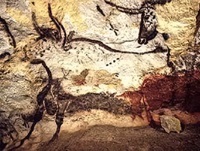 The paintings were made about 30,000 years ago and depict wild boar, deer and majestic bulls. Unfortunately visitors cannot view the actual paintings anymore because the caves have been closed to the general public to prevent deterioration, but a replica gives visitors a clear picture of the remarkable works. Travellers can still enter the incredible Cave of Font-de-Gaume and see the original rock art in this UNESCO World Heritage Site. The town has some excellent museums in which prehistoric art and artefacts are on display. Be sure to visit the Chateau de Commarque, a truly remarkable site boasting the ruins of a 12th-century chateau and caves containing prehistoric artefacts and paintings.